A tiny cottontail on the edge of extinction has gained a foothold on forever, thanks to the Endangered Species Recovery Program (ESRP) of Stanislaus State and the National Geographic Photo Ark project. The riparian brush rabbit, whose numbers had dwindled to perhaps a few dozen, has been spotted worldwide since Sept. 7 on a National Geographic video post that has received more than 1 million views on Instagram. Photographer Joel Sartore’s images of the light gray bunny, with its distinctive pouchy cheeks, have joined 7,000 species captured for posterity. Sartore founded the Photo Ark so “that people will look these creatures in the eyes, and be inspired to care, while there is still time.” More than an effort to document the planet’s biodiversity, he and National Geographic seek to spur innovative efforts to save threatened species and raise funds for conservation, including through the #SaveTogether campaign. The suddenly famous brush bunny, tagged #0956 after the photo shoot, modeled for Sartore after being coaxed from underbrush on a scorching summer weekend by Patrick Kelly, ESRP coordinator and zoology professor, and Stan State students Celia Tarcha, Rachael Devaughn and Antonio Garcia. “He only weighs about 1 pound, and lots of other critters would like to eat him. That’s why they have the name brush rabbit. They hide out in dense brush,” Kelly noted. The little lagomorph rarely strays more than a few feet from cover. It was once common in parts of the Central Valley, but farming and suburban sprawl reduced its habitat, and predators, including feral cats, decimated its numbers. 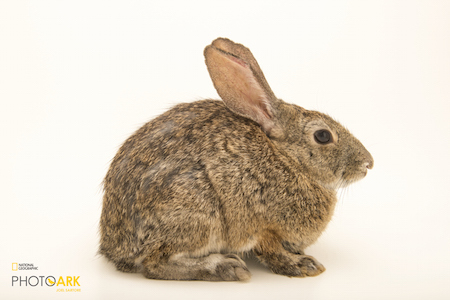 In cooperation with private land owners and state and federal agencies, Stan State’s Endangered Species Recovery Program successfully bred captive rabbits from 2001 to 2013 and reintroduced those furry families into the wild. Today their descendants live in growing colonies on San Joaquin River National Wildlife Refuge and conservation partner lands, including the Faith Ranch. The effort got a helping hand from the largest contiguous riparian habitat restoration program in California, which introduced thickets of willow, wild rose and blackberry favored by the diminutive mammal. “When I was a small child reading National Geographic at my granduncle’s house in Galway City in the west of Ireland, I never dreamed that someday I would be working with a National Geographic photographer on a project,” Kelly said. Now he looks forward to doing so again.